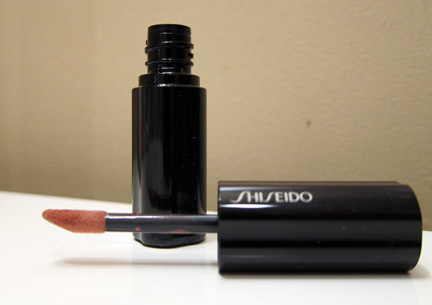 THE SKINNY: Shiseido's Lacquer Rouge liquid lipstick feels like buttery goodness on my lips. I love the feel of it, but I really wish it lasted longer than an hour or two. For $25, it has a really short lifespan. I tried this lipstick in a color called "portrait" that is about the same shade as my natural lip. If I found a good sale somewhere, I'd love to try it in a darker shade to see if that boosts its staying power. This is a moisturizing lipstick, and that part of it does work great. My lips didn't feel dry or gritty after continued use. KEEP OR TOSS: Keep. I paid $25 for it after seeing the advertisement in nearly every fashion magazine out there, and the color isn't bad. CHECK IT OUT: Lacquer Rouge comes in eight colors.